Matthew 9:37-38: Then saith He unto His disciples, the harvest truly is plenteous, but the labourers are few. Pray ye therefore the Lord of the harvest, that He will send forth labourers into His harvest. Following up from the AOY conference in December 2013 which sought out youthful labourers for the Master’s vineyard, AOY-SALT was born to train and mobilize these armies of workers to be God’s helping hands. 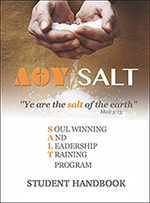 AOY-SALT is an evangelistic school that provides young people with an avenue to join mission work and test out their calling for ministry. SALT is committed to raising up those who are called to win souls in their communities and serve as a Bible worker for local churches. The SALT program consists of three parts - classroom, practical, and then field training. SALT’s course of study is designed to equip lay people with the knowledge, skills and tools for being effective soul winners. The classes are taught in modules so it allows young people, professionals, and any people of any age to join, so that if they want to attend a specific class, they only need to take a little bit of time off. This will help you deepen your understanding of the Bible and to answer difficult Bible questions with confidence. Practical subjects such as evangelism and preaching will also be taught. This will help you develop skills to become powerful and effective Bible workers for Christ. At the end of AOY SALT, students who are interested in testing out their calling for full time ministry will be given the opportunity to serve as bible workers. Unit 22-1, Block A, Kuchai Business Center, Jalan 2/114, 58200, Kuala Lumpur. Full-time students are required to stay in the accommodation provided and need only pay a small amount for their housing and food per month. Part time students who do not stay at the accommodation provided will be charged a thanksgiving cost for their usage of PEM Mission utilities of RM50/week according to how long they attend for. SALT does provide a sponsorship program for students who need assistance in coming up with their tuition fees. More details can be found in our student handbook. For more detailed information about our program, please take time to read through our Student Handbook. Sign up with your email address to receive monthly news about and updates about AOY and AOY SALT.